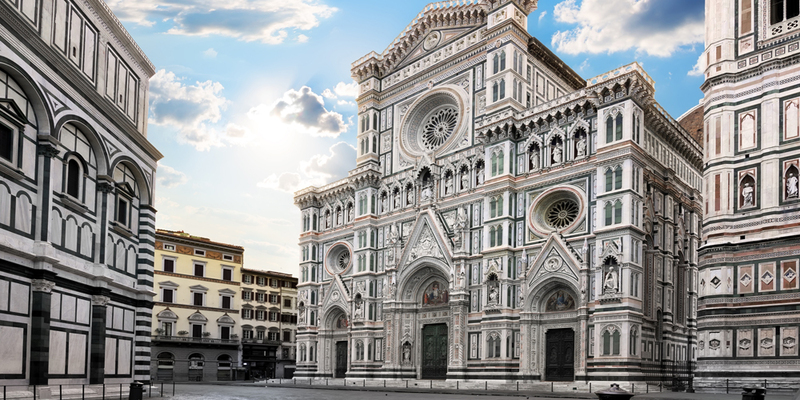 Florence’s cultural heritage is second to none in the world, but there are so many places to see! And there may not be enough time. Are you already worried about finding your way around? Then you can rely on us: download and follow the GuidaTour app, the perfect audio tour guide for a beautiful visit to the city. The GPS tracker gives you an authentic personal tour guide at your side to facilitate your tour with simple, intuitive descriptions. Indeed, if Tuscany is considered a so-called “museum-region”, then Florence, its regional capital, is the ultimate “museum-city”, studded with art collections, ancient stately residences, squares and churches, enduring elements of vibrant local community life. Moreover, this land is the cradle of the Etruscan civilisation; when it became a Medieval commune, the city was the backdrop for harsh yet gripping local political struggles (between the Guelphs, who were on the Pope’s side, and the Ghibellines, who supported the Emperor). Under the reign of the Medici family, the city gave life to one of the most illustrious, artistic and scientific periods of all times: the Renaissance. Over the centuries, the city certainly never lost it pivotal role, even becoming capital of the Italian Kingdom. Today it is a city with many faces: not only is it the cradle of the Italian language, being the birthplace of Dante Alighieri, but it also the set of fascinating popular traditions, such as the Scoppio del Carro (“Explosion of the Cart”) every Easter Sunday, or the Calcio storico (“Historical football”) matches. 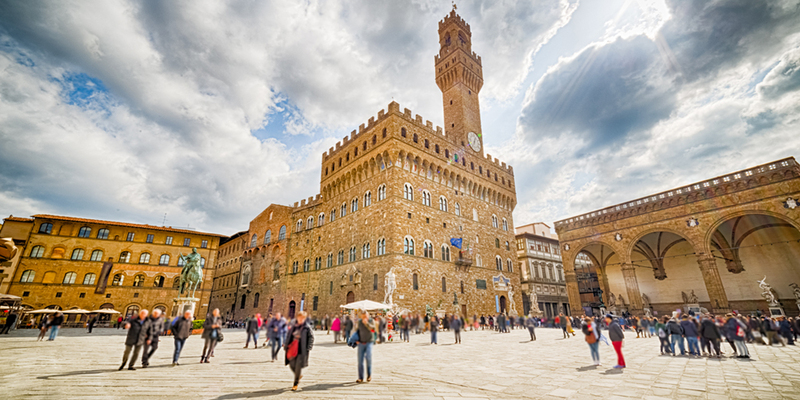 Rely on Guidatour, our destinations and voices to spark your imagination as we guide you around the Cathedral, with Brunelleschi’s imposing dome, Giotto’s Gothic bell tower, the Romanesque Baptistery, the Palazzo Vecchio, Piazza della Signoria, Palazzo Pitti, the home of the Medici, and Palazzo degli Uffizi, which houses the exceptional art collection of the same name, all the way to Santa Croce, where you can visit the tombs of the greats, illustrious Italians who embody creativity and profound cultural heritage for all generations to come: Michelangelo, Galileo, Machiavelli, Foscolo, Alfieri. 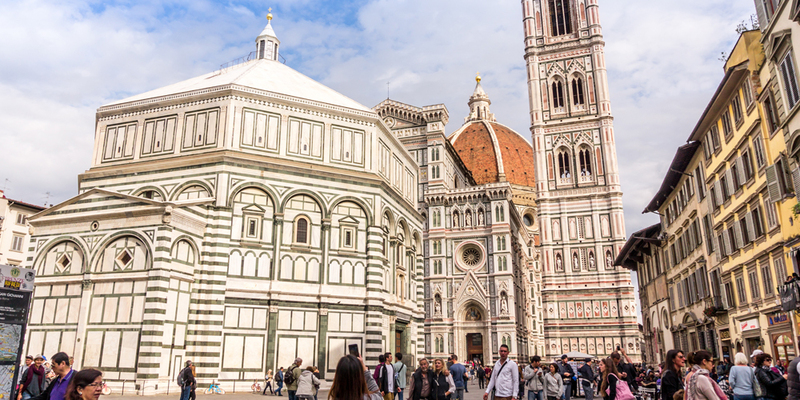 As someone in the 18th century once said, the Piazza del Duomo is more than a square; it is “a beautiful theatre”, with the Baptistery, Cathedral and Campanile (the Bell Tower) as its set. Today, although constantly crowded with tourists, it remains a beloved part of life for the native Florentines. It is exciting to go there at Easter, for the yearly Scoppio del Carro or “Explosion of the Cart” ceremony. Although the “beautiful Saint John”, quoted by Dante in the 19th canto of Inferno, was consecrated by Pope Nicholas II in 1059, building work was not completed until the end of the 12th century and the beginning of the 13th. 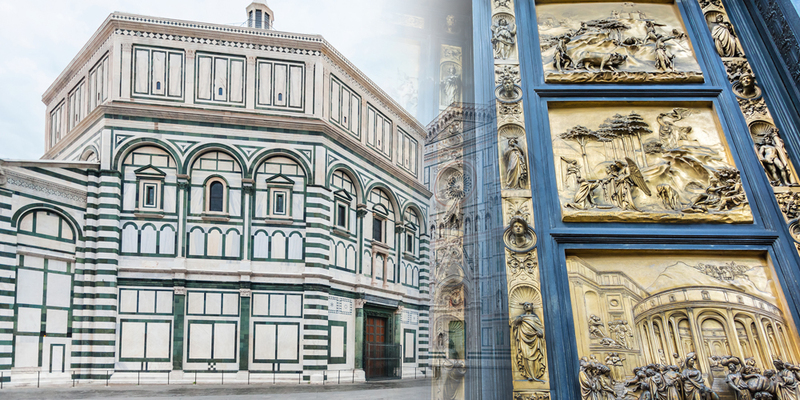 Among the Baptistery’s “battezzati eccellenti” (great personages baptised here) are Amerigo Vespucci, Antonio Meucci and Carlo Collodi, whose names are found in the baptism registers, conserved in the Archive of the Opera di Santa Maria del Fiore. Indeed, until 1945 the Baptistery was the only baptismal font in the city. The metropolitan Cathedral of Santa Maria del Fiore (“Holy Mary of the Flower”), commonly known as the Duomo di Firenze or Florence Cathedral, is the city’s main church, built by the Florentines to surpass the dimensions and splendour of every other church in Christendom. It is the third largest church in the world. Building began in 1296 under Arnolfo di Cambio, one of the Renaissance’s most characteristic artists working in Italy in the second half of the 13th century, and was continued by Giotto, Andrea Pisano, Francesco Talenti and Filippo Brunelleschi, who was responsible for the world famous dome. 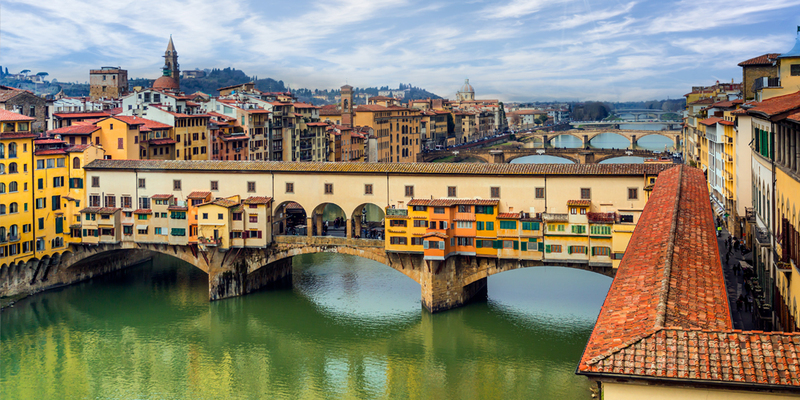 The river and the bridges have always been a part of life for the people of Florence. Many festivals were celebrated on the river or along the bridges: there were dances in May, the so-called “maggiolate”, in the area around the Santa Trinita and Carraia bridges, as well as the wedding celebrations for Cosimo II and Maria Maddalena of Austria in 1608, celebrated on the Arno between the Santa Trinita and Carraia bridges, and a festival to celebrate the sudden freezing of the Arno, which still takes place today. Still today, on the 8th September people celebrate the Festa della Rificolona (Paper Lantern Festival), when children and adults can punt along the river in decorated and illuminated “renaioli” boats. The second municipal wall (1284-1333) wall was built under the guidance of Arnolfo di Cambio. This period saw the emergence of on-going public building works as part of a proper urban planning policy, with Arnolfo followed by Giotto, albeit to a lesser degree, as its main architects. New roads were built, a road system was organised and works began on the construction of the new Cathedral and the Palazzo dei Priori. The need arose to create a large public space, as, at that point, Florence had only small open spaces and no proper city square. Around the beginning of the 13th century, Florence was in the grips of the violent conflict between the warring Guelphs and Ghibellines. Slowly, the economic development of the city strengthened the “popolo grasso” (wealthy middle classes) – made up of dealers, entrepreneurs and bankers – who organised themselves into corporations or Arti Maggiori (“Greater Guilds”), and were able oppose the feudal-based aristocracy with increasing success. With the 1282 reforms, economic control of the city fell into the hands of the Signoria dei Priori delle Arti, the “Priors of the Guilds” who represented the Arti Maggiori, Medie and Minori (“Greater”, “Middle” and “Lesser” Guilds). The Priori delle Arti, together with the Gonfaloniere of Justice, were in charge of running the municipality. In the 1800s, the 13th-century Palazzo del Podestà, built in Dante’s youth and Giotto’s adolescence, was rebuilt by Francesco Mazzei and decorated with frescoes in the medieval style by Gaetano Bianchi. 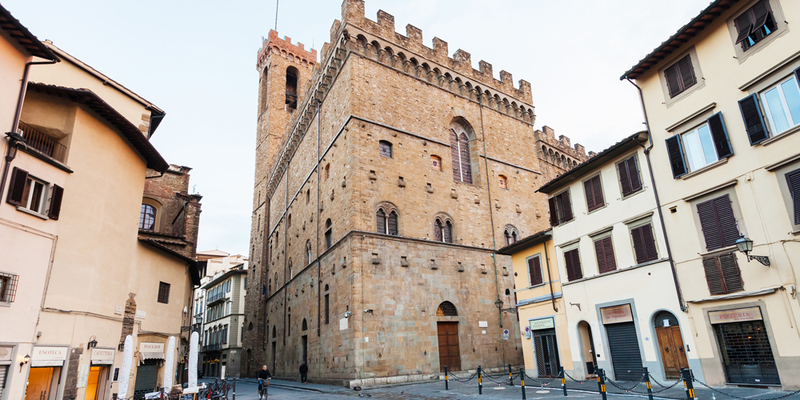 It was built to house the famous Museo del Bargello, which holds collections of sculptures and various items of inestimable value, including works by Donatello, Andrea del Verrocchio, Michelangelo, Della Robbia and many more. The Dominican Order, custodians of the doctrine of Saint Dominic, sought to impose the hierarchical and rational order of God’s creative thought upon the Earth. 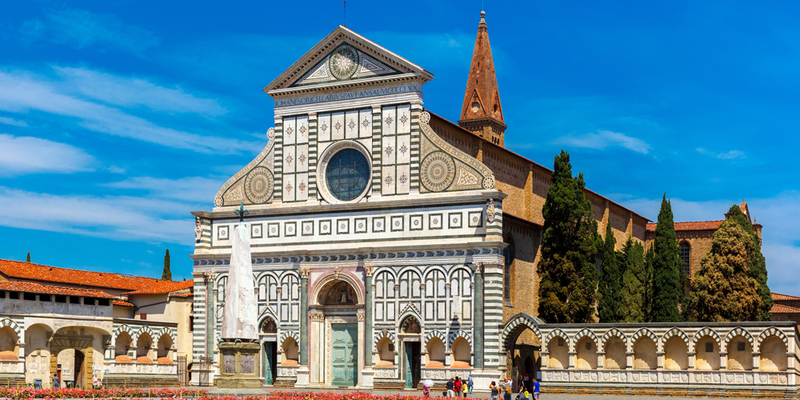 This ideology inspired the design of Santa Maria Novella, which is large and plain, but very clearly proportioned. It may be plain, but the simple materials create a beauty of their own. In 1550, Eleanor of Toledo, the wife of Cosimo I, bought the building from Luca Pitti, with the attached square, old houses and vegetable garden extending as far as the 14th-century walls. 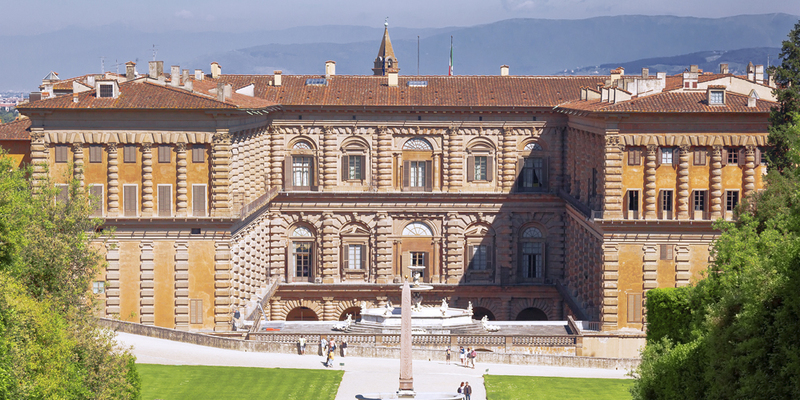 The purchase had been made with the intention of finding a home surrounded by greenery, which also met the new requirements of the Medici court. 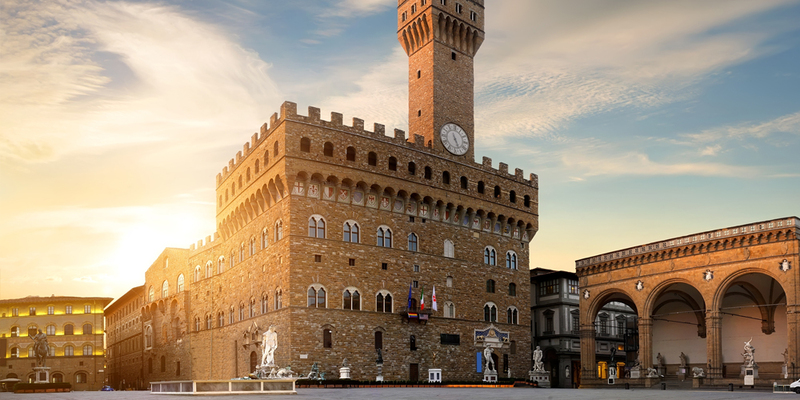 Indeed, the Palazzo della Signoria was more like a fortress than a building fit for the new generations. 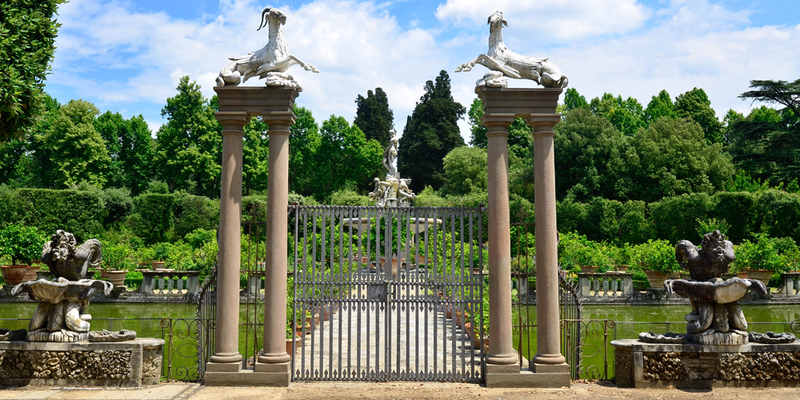 The Boboli Gardens were originally designed as a fusion of agricultural and natural landscapes. This mixture of natural and artificial is particularly evident in the man-made, decorative caves or grottos, found in nearly all of the gardens. Vasari built the lower section of the Grotta Grande, with Buontalenti completing the work with the upper section between 1556 and 1593. The Grotta was designed as an ode to water.